The apple caviar is a great way to bring molecular gastronomy to your cheese plate, desserts or drinks. Pair it with strawberry sorbet, banana foam, foie gras, Gruyere cheese or an apple martini. The little spheres will burst in the mouth releasing a delicious fresh apple juice. 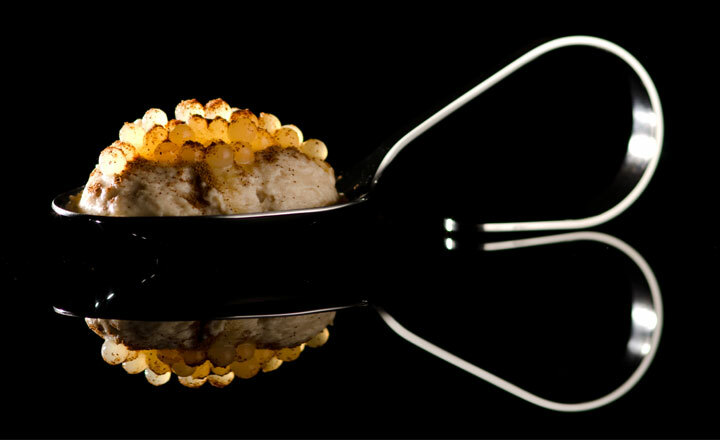 The apple caviar is made using the basic spherification technique developed by molecular gastronomy Chef Ferran Adria. This recipe is based on Ferran Adria’s famous apple caviar. 1- Wash and core apples and extract the juice using a centrifugal juicer. 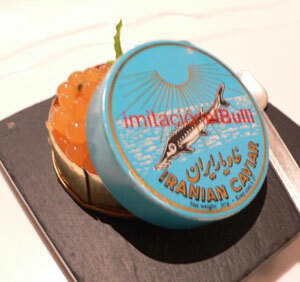 It is useful to understand why browning occurs to reduce it and obtain a nicer looking caviar. Browning of fruits such as apples occurs when phenolic compounds and enzymes come in contact with oxygen from the air as we cut the fruit. Ascorbic acid is usually used to coat the fruit and slow the activity of these enzymes to prevent browning. However, in this case, the acidity will inhibit the jellification process used for making caviar. A preferred method in this case is to start with cold apples and follow with brief heating of the extracted juice, which kills the enzymes and slows the browning process. So extract the juice and quickly perform step 2 and 3. 2- Mix the sodium alginate with the apple juice using an immersion blender until the sodium alginate is completely dissolved. If this is your first time doing this, be aware that this may take longer than expected. 3- Immediately heat the mixture to 96 °C (205°F). Strain the mix and store it in the fridge until serving time in a sealed container. 4- Prepare the calcium bath in a bowl by dissolving the calcium chloride in the water. 5- You are now ready to start creating the caviar! Add the apple-alginate mixture to the caviar maker tray. A minimum of 75 ml must be in the tray in order to avoid breaking vacuum when it is aspirated. 6- Replace the top section of the caviar maker over the tray containing the caviar mix. The tips of the 96 wells will now be immersed in the caviar mixture. 7- Back off the syringe plunger to 5cc. Creates air space to provide extra push at the end of the dispensing cycle. 8- Attach the tubing to the syringe. 9- Aspirate the syringe plunger to the 20 ml mark on the barrel of the syringe in a slow and steady motion. 10- Carefully lift the caviar maker from the tray and place it about 3 inches over the calcium bath. Slowly depress the syringe plunger from 20ml to 0 ml. 11- After a minute, remove the caviar spheres from the calcium bath, rinse them in a clean water bath and serve immediately. The jellification process continues even after removing the caviar from the calcium bath and will eventually convert into a solid gel sphere with no liquid inside. 1- Wash and core apples and extract the juice using a centrifugal juicer. 2- Strain juice and place over medium heat until reduced to caramel consistency. 1- Process the banana, sugar and milk with an immersion blender. 2- Sprinkle with gelatin and allow to soak for a minute or two. 3- Heat over very low heat, stirring constantly, until gelatin is fully dissolved (approximately 5 minutes). 4- Remove from heat and stir in the heavy cream. 5- Using the ISI funnel and sieve, pour the mixture into an ISI Whip or Culinary Whipper with desired nozzle, screw 1 cream charger (2 if using 1L ISI Whip) and shake 5 times. 6- Let it rest in the refrigerator for at least 4 hours. 1- Pump some banana foam on an appetizer spoon. 2- Place a spoon of apple caviar on the foam. 3- Season caviar with some apple reduction.